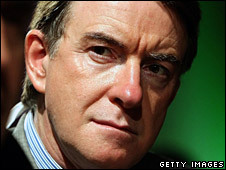 Lord Mandelson says the car industry is an essential part of UK manufacturing. The UK car industry does not need a bail-out but the government is considering help for manufacturers' financing arms, Lord Mandelson says. He told the BBC that the industry faced problems raising finance to help would-be buyers fund new car purchases. Lord Mandelson said the Treasury was considering offering commercial loans or loan guarantees to help the industry "bridge a very difficult period". Meanwhile, an industry body confirmed it was in talks with the government. "We are in active discussion with the government to ensure that motor finance companies, along with other non-bank lenders, have access to the relevant government liquidity and guarantee schemes, so that they can get the funds they need to serve their customers in the motor and other markets," Stephen Sklaroff, Director General of the Finance and Leasing Association, told the BBC. Lord Mandelson said the credit crunch has meant that manufacturers' car financing arms could not raise the money needed to fund new car purchases. "No car company is asking for a bail-out, they may be asking for help in lifting their motor finance arms, needed to fund new car purchases," he told Radio 4's The World At One. "And it may be that in one case, commercial loans or loan guarantees from the government to assist them to bridge a very difficult period (may be needed) but that is not what I would call a bail-out." He said both he and the Treasury were in close contact with the car companies about this issue. Nissan announced on Thursday that it would cut 1,200 jobs. A spokesperson for the Society of Motor Manufacturers and Traders welcomed Lord Mandelson's remarks but said that help in providing car financing was just one part of a series of measures it was seeking. As well as easing access to finance, the SMMT is calling on the government to help companies to retain skilled employees and maintain investment in new technology and provide incentives to encourage the take up of new vehicles. John Lewis, chief executive of the British Vehicle Rental Leasing Association, welcomed any measures to improve access to credit but said they should apply to all providers of car loans not just manufacturers. "Any help with access to finance must not be limited to car manufacturers alone. It should be used to improve access to all routes of car finance, for new and used cars," Mr Lewis said. Lord Mandelson said that the car industry was an "essential and permanent" part of the UK's manufacturing but warned that the industry must adapt to leaner times. While demand for cars had been hit by the recession, he said that demand may never get back to previous levels. He did not rule out further job losses in the UK car industry but said that white-collar positions would be more likely to go than manufacturing jobs. In the US, as part of its rescue of the car industry in December, the government has unveiled a $6bn (£4.1bn) rescue package for GMAC - General Motors' troubled car loan arm.